Vice Chairman of the Binh Phuoc province People’s Committee Huynh Anh Minh had a working session with representatives from Nedspice Vietnam, a spice processing firm of the Netherlands, on enhancing cooperation in trade promotion and the sustainable production of the locality’s pepper products. Jan Gihuis, senior manager of the Netherlands’ Sustainable Trade Initiative organisation, said Nedspice has built many sustainable production models in Binh Phuoc. He added that the firm plans to expand more models like this in the locality and hopes that it will continue to receive the support of local authorities in the field. At the meeting, representatives from Nedspice Vietnam pledged to buy over 10,000 tonnes of pepper cultivated in the southern province of Binh Phuoc, accounting for one third of the locality’s total pepper production in the locality. Statistics show that about 1,500 households in Binh Phuoc are joining projects implemented by Nedspice, and about 60 sustainable production clubs are applying cultivation techniques provided by Nedspice on an area of over 2,100ha of peppercorn. Local famers involved in European-standard pepper cultivation models will earn an extra 5,000 VND per kilogram of pepper they produce and be able to enjoy many other incentives. Minh praised Nedspice’s capacity in supporting local farmers in promoting pepper production and consumption. He expressed the hope that Nedspice will continue to maintain its application of sustainable cultivation techniques in the locality, towards building a geographical indication for local pepper products. 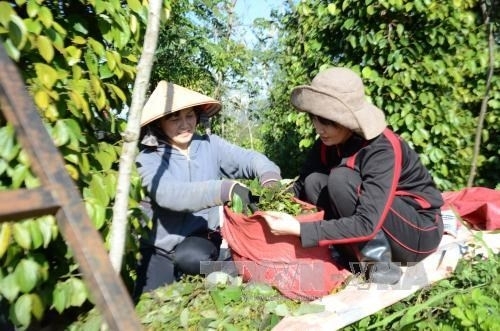 Pepper is one of the key crops of Binh Phuoc, however the pepper sector is facing many difficulties due to price fluctuations and the effects of disease and climate change. 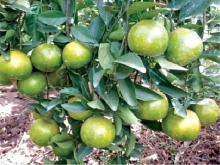 The local authorities have encouraged local farmers to enhance the production chain link and expand organic production models to create high-quality products meeting the market demands, especially for exports. Binh Phuoc has over 17,700ha of pepper, with annual average yield of 30,000 tonnes, including 1000 tonnes for export.